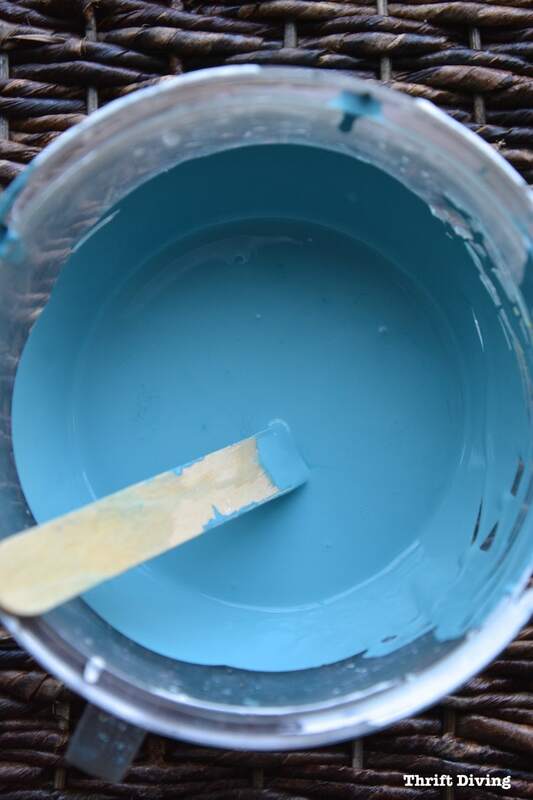 You are here: Home / DIY / Paint / Should You Make Your Own DIY Chalk Paint? Some time ago if you had asked what paint you should use to paint furniture, I probably would have said, “Annie Sloan Chalk Paint!” without hesitation. That’s because I was one of those die-hard “Sloan” fans that raved about how wonderful the paint worked and how you could paint anything and everything and–GASP!–no sanding or priming! But times have changed, my friends. Because now there are many more players on the Furniture Painting field. The ball’s not just in Annie’s court anymore. I can count on two hands (maybe three??) the number of alternative furniture painting products on the market. They all stick to the ugliest furniture. They all require no sanding or priming. And they all are readily available. The difference in choosing which paint to use is two-fold: the look you’re going for and COST! I wrote a post recently on what I thought were the best 12 paints for furniture. While most of them I have used, a few of them I hadn’t yet tested. 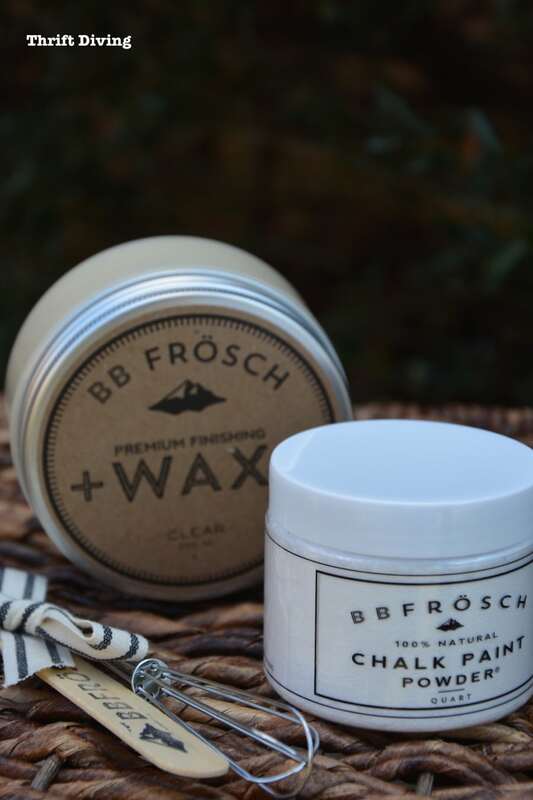 One of them I was super curious about, called BB Frosch, which is a chalk paint powder added to regular flat latex paint to make your own DIY chalk paint. I had reached out to them asking to do a review and because being a blogger has its perks, they sent me a 4 oz sample and wax to try out. I admit I was super curious about this powder. 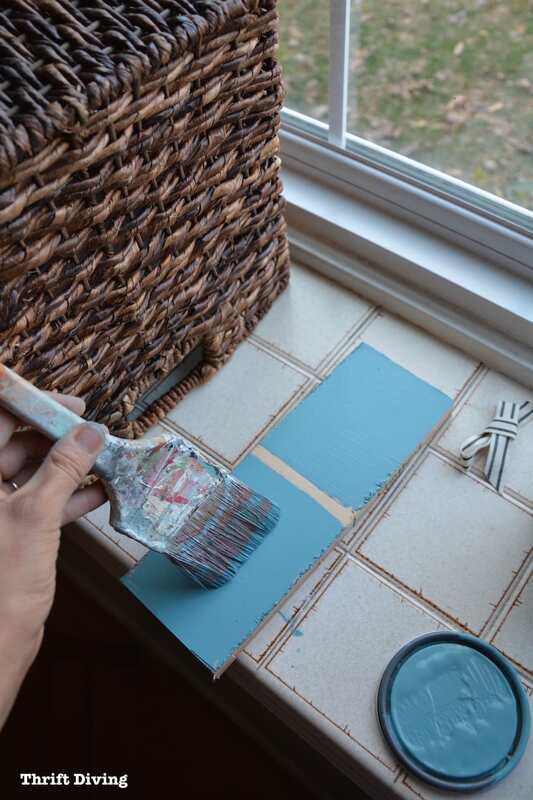 I mean, if you’ve been in the DIY-o-sphere for any amount of time, you know every furniture restorer has, at one time or another, made DIY chalk paint with either sanded grout or plaster of paris. And this is the detailed response she sent back to me. There are many reasons not to use DIY recipes like Plaster of Paris and unsanded grout (to name just two of the MANY.) First, the products contain ingredients not intended for paint. Often, those ingredients can be toxic, which eliminates the “eco-friendly/no-chemicals” attributes of chalk paint. 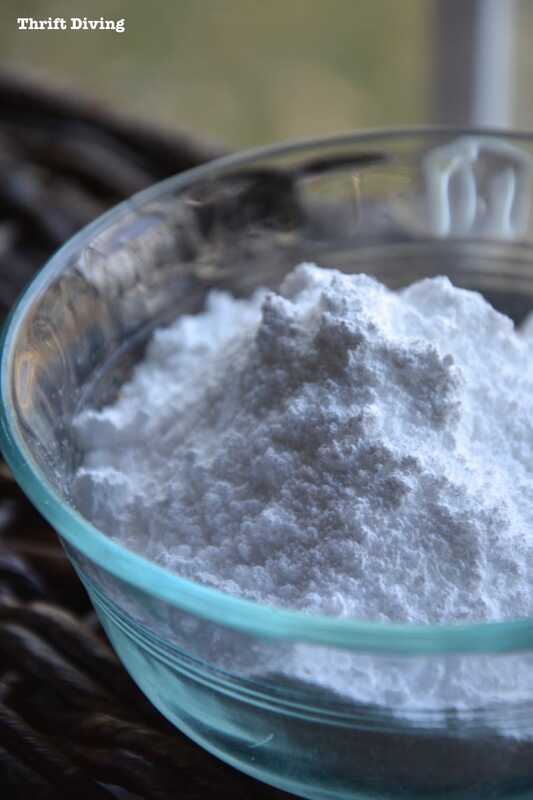 Think of what happens to Plaster of Paris when water is added…it turns to PLASTER, which is what it is intended to do, but not exactly what you want for paint. Given that directions for products like these specifically outline using protective gear, you definitely don’t want to paint with them indoors, let alone sand or distress and create dust to breathe. 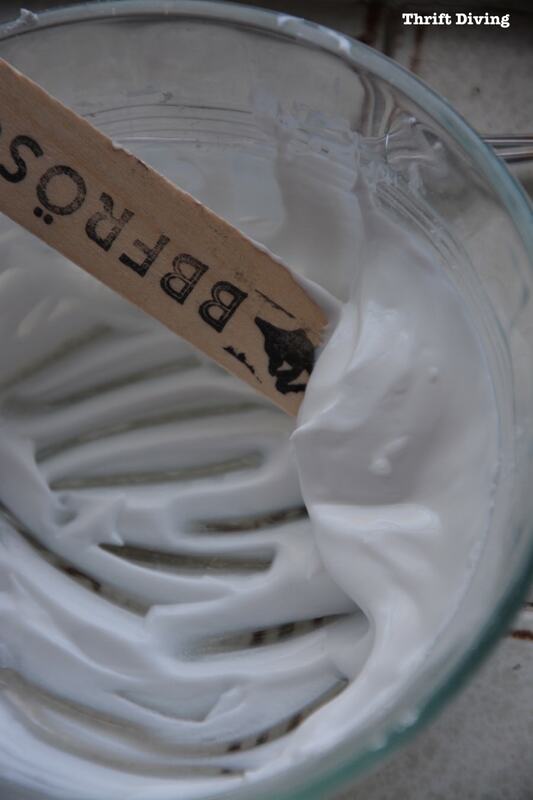 One of the features of chalk paint is that it is safe to use indoors and around children. It is counter-intuitive to use a product that can burn skin and isn’t safe to breathe. There are MANY blog posts about DIY ‘recipes’ that contain seemingly safe ‘chalk-like’ products. 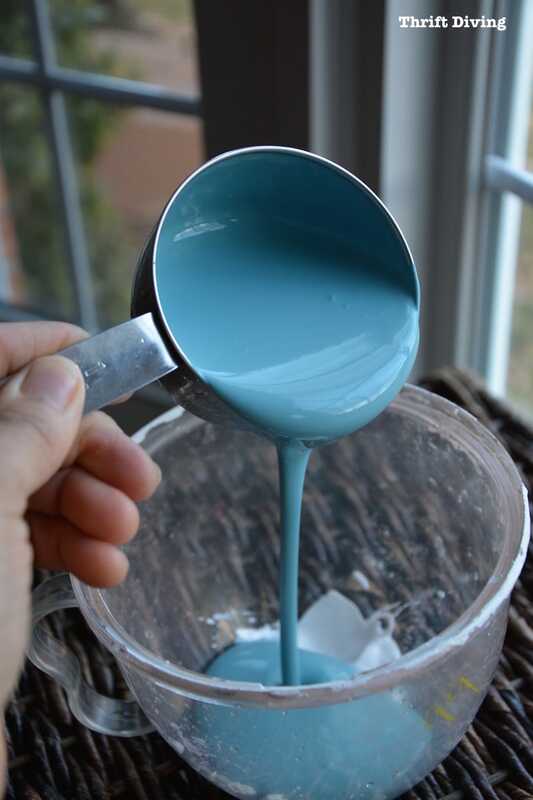 While the ingredients may not be harmful, and they may have one or two features of chalk paint minerals, they aren’t processed specifically for chalk paint, so they don’t have ALL the properties that make chalk paint so amazing. The minerals in BB Frösch are specially blended to feature optimal bonding as well as the ability to distress and manipulate paint. Equally as important as WHAT the minerals are, is HOW they are processed. 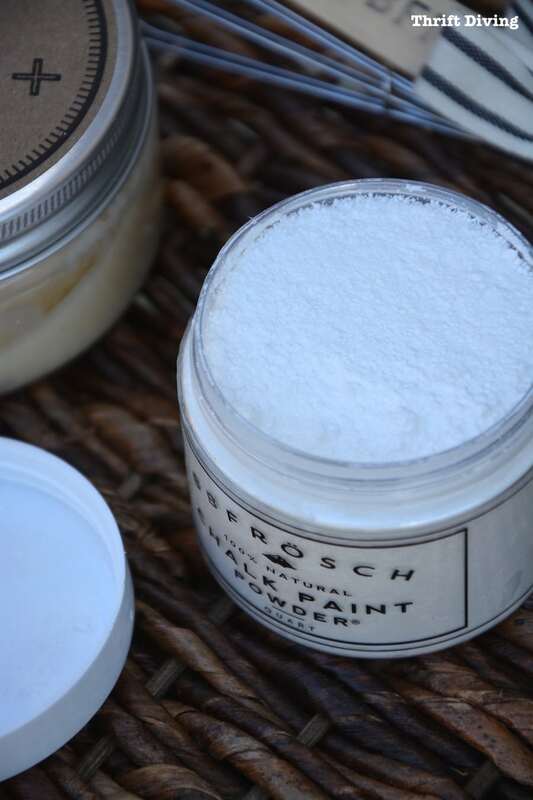 You will notice that BB Frösch Chalk Paint Powder is highly refined and “fluffy.” In fact, it is processed so fine that it is less than half the density of any other similar minerals on the market. This is an important feature for chalk paint because it promotes the self-leveling properties of chalk paint as well as makes a finished surface smooth, not gritty. Imagine baking a cake that calls for baking powder. 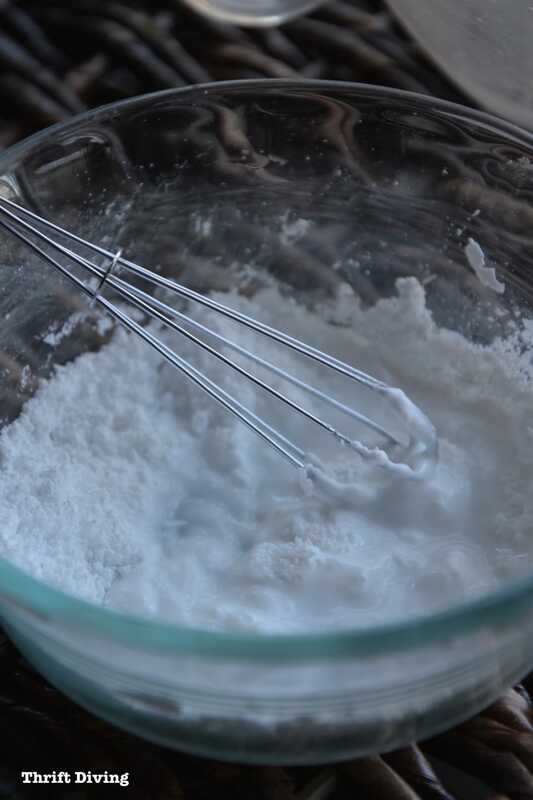 What would happen if you substituted baking soda because it looks and feels virtually the same? The outcome would be dismal! If you want the “wedding cake” experience of chalk paint, you NEED the right ingredients. Incidentally, I have found that there are three important elements to a positive chalk paint experience, and if any one of them is missing, the results are less than awesome. Those elements are: ingredients, tools, and knowledge/experience. It doesn’t have to be expensive, you just need all three elements. True chalk paint is more than just paint that can bond to virtually any surface without prep work. It is always either voc-free or low-voc. It is the most manipulatable paint available. Unfortunately, boutique brands are expensive, not readily available, and limited in color choice. DIY recipes cannot replicate ALL the incredible features of true chalk paint. BB Frösch solves EVERY issue (affordability, color choice, feel, ALL features and benefits) and more. With BB Frösch, your finished project should FEEL as good as it looks. You can add BB Frösch to ANY paint brand you like. If you love Benjamin Moore, use it. If you like the affordable sample pots from Home Depot, use those. If you live near an Ace Hardware, use their brands. Finally, you have the flexibility of adjusting the amount of powder to create even more options and finishes. But my friend, Gail, from My Repurposed Life has been painting furniture a long time. She uses a DIY chalk paint recipe with a semi-gloss paint with plaster of paris as a primer, and then adds a second coat of semi-gloss as a top coat. 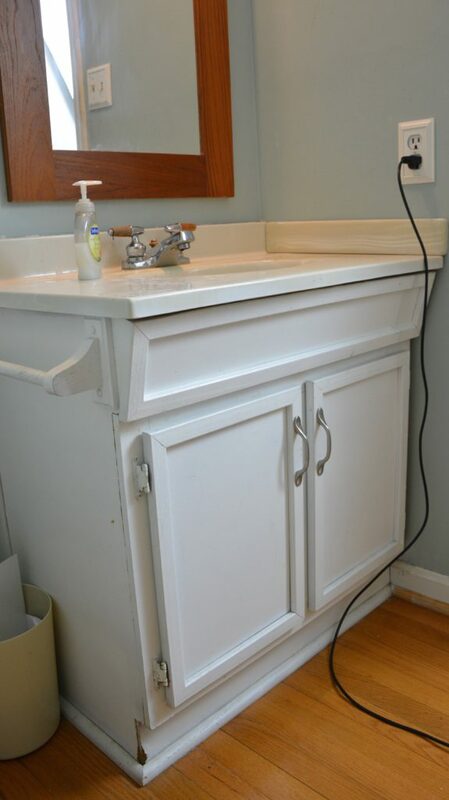 AND she uses her DIY chalk paint in her HomeRight paint sprayer. So I know it can be done. 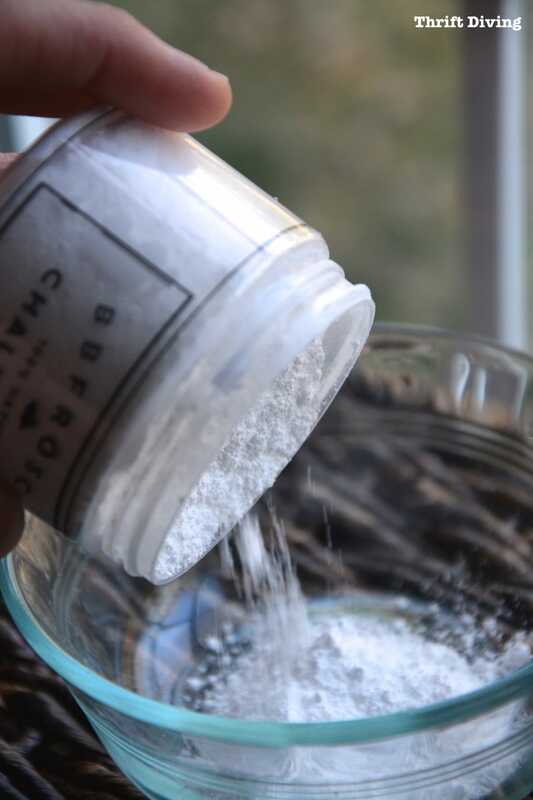 But, the folks at BB Frosch were right that their chalk powder is very fluffy! I wasn’t sure how much I was going to use, but the whole 4 oz container of chalk powder was for 1 quart of paint. I had a flat finish in Behr Cabana Blue (OMG, ah-ma-zing color!). 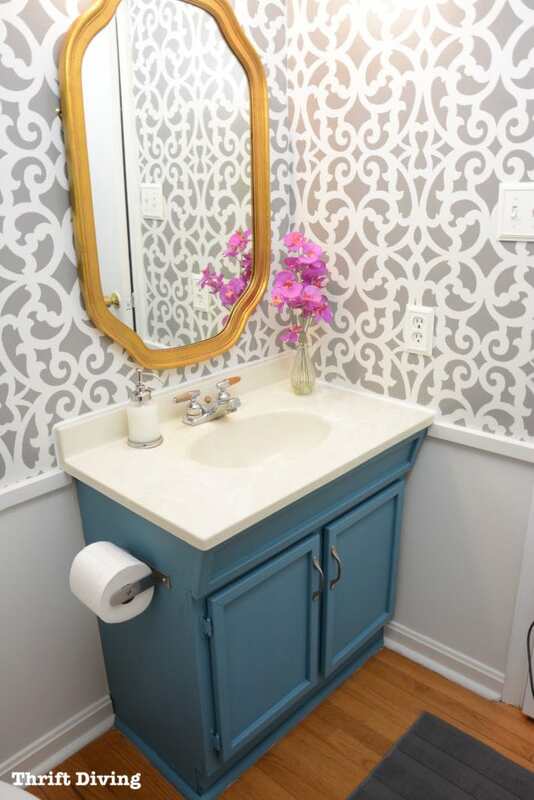 This is the paint I was using for the vanity in my small bathroom makeover. I didn’t want to mix the whole batch, so I just used 1 heaping teaspoon and mixed it with 1 teaspoon of water. The instructions say to get it like pudding or custard. It kind of makes me hungry (or it could just be this crazy diet that I started. Sorry, tangent….). After it was all mixed up, I added 1 cup of paint to the pudding-like mixture and stirred it up well. The texture was smooth. No bumps or lumps! And no grittiness, either. First I tried to add it to a sample board, to see how alike or different it was from the flat paint. On one side I painted the bare board with the flat paint (non-chalked) and the right side I painted it with the chalk paint mix. I’m regretful to say that I have lost the sample board and have no pictures of what it looked like once dried. HA! I can’t seem to remember where I put it!! How frustrating…. But what I can tell you is that once it dried, there didn’t appear to be any noticeable difference between the “not chalked” and “chalked” sides. It could be that I used raw wood, and most paints would stick well to raw wood–chalked or not chalked. But the real test was my small bathroom vanity. This is what it looked like at the start of my small bathroom makeover. It was already painted in a white semi-gloss from years ago. I didn’t prime it or sand it before getting started. I just got started painting and crossed my fingers the paint wouldn’t come off. I ended up adding two coats, and the coverage was really good. What I really liked about it is that the paint went on smoothly. I don’t know if you’ve used prepared chalk paints before, but it’s thick. A lot of times you have to make it a little more watered down to get smooth coverage. 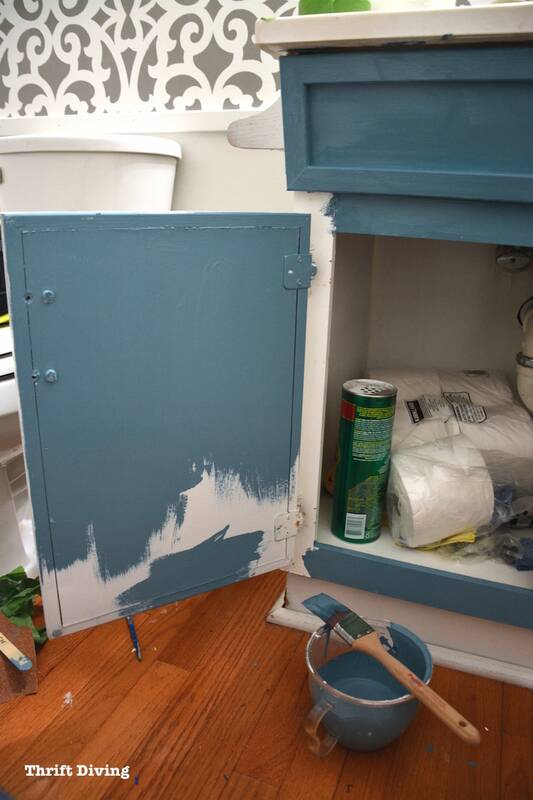 With this Cabana Blue chalked paint, it went on so smoothly and it spread it more easily, which made me feel like I could paint the vanity faster. Okay….so it worked well, but how was it going to sand?? One thing I LOVE about Annie Sloan chalk paint is that it sands sooooo smooth, like a baby’s booty. LOL. Feels magical! I noticed that BB Frosch definitely smoothed and got “chalky” when sanded, but it definitely didn’t have that “Annie-Sloan-butter” feel. But you know what?? It still felt pretty good. I was pleased with the outcome! They sent me some clear wax to try out, and I’m going to be honest, I didn’t like the way this stuff smelled. It gave me a bit of a headache as soon as I opened it. It kind of reminded me of Annie Sloan’s clear wax, but this one smelled stronger. 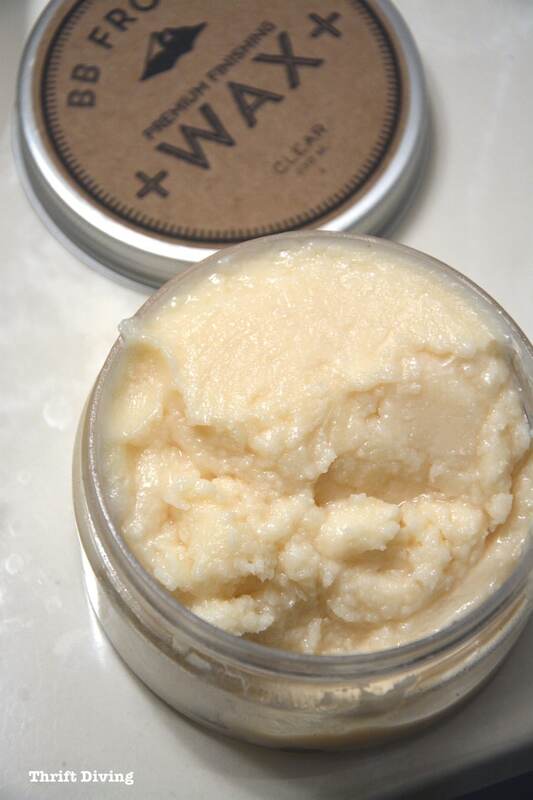 I have used Miss Mustardseed’s furniture wax on several projects and I have to say, hands down, Miss Mustardseed’s wax is my favorite because it has less odor! The little container they sent to me (4 oz) is $10, but it also comes in 36 oz for $32. That seems super reasonable, but let’s look at the math. Most chalk paint (like Amy Howard at Home One Step furniture paint) is about $34.99 and up. If you’re like me, you’d most likely buy a quart of flat Behr paint from Home Depot for about $13. If you buy a $10 container of BB Frosch chalk powder, that quart would cost about $23 to mix yourself, much less than the $34.99. You could cut costs even more by buying a gallon of your favorite flat paint, or even a small sample pot. I won’t bore you with all the math, but if you bought a gallon of your favorite paint, it would cost about $54 to make a gallon of chalked paint, versus $152 for a gallon’s worth of Annie Sloan. That’s a HUGE savings! I think what sold me is the health benefits of using this chalk paint powder versus plaster of paris. As DIYers, we probably don’t think a lot about the health consequences of the products we use. And I do sand my projects after I paint them (especially when going for that slightly distressed look). They’ve got a point–if you’re sanding projects that have plaster of paint on them, do you really want to be inhaling that stuff? I’d rather use something that’s safer and not spewing harmful chemicals into the air. I definitely think you should try this chalk paint powder, but try another wax, like the Miss Mustardseed clear wax, which has less odor. 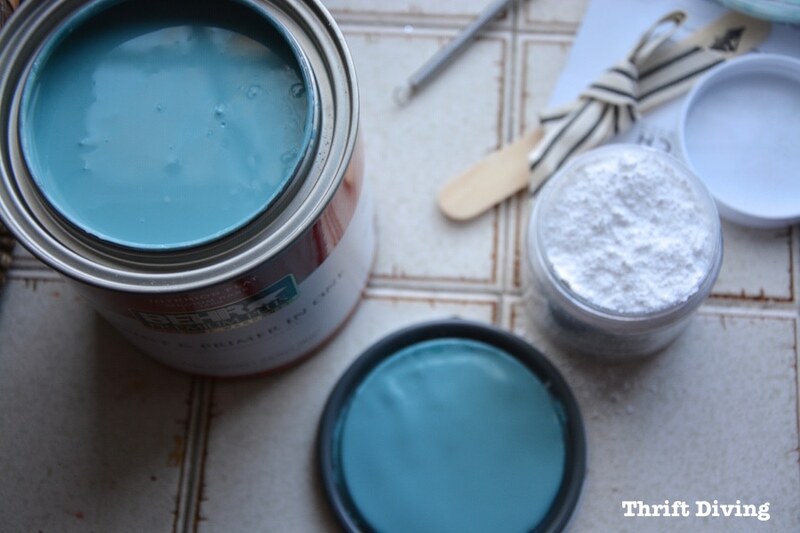 I’ve decided that I’m going to use this chalk paint powder on more projects! I’ve got a furniture painting class coming up and I’m going to use it with my students! I like the cost-effectiveness of it, but I really love that it’s safe to use and to sand. Have you guys ever heard of BB Frosch? (Heck, I don’t even know how to pronounce it. HAHA). What do you guys think about using this instead of ready-made chalk paint? Leave your thoughts below and let’s chat about it! 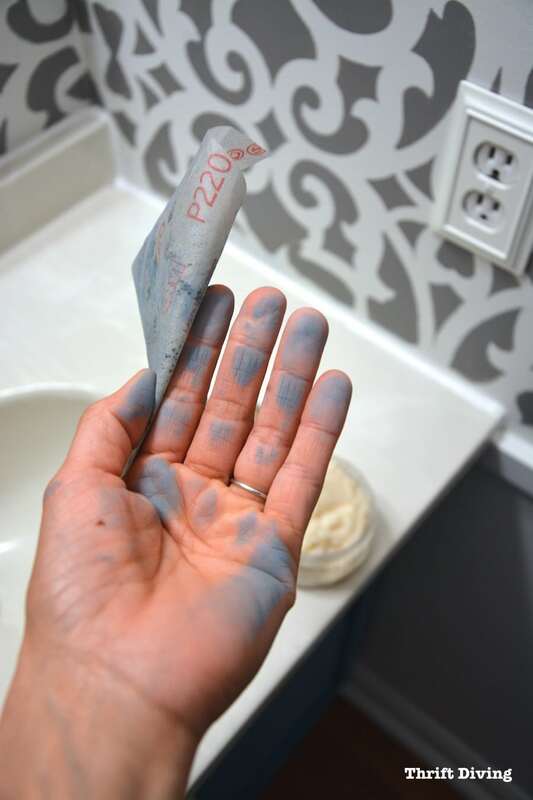 « BEFORE & AFTER: My Colorful Gray Bathroom Makeover With a Wall Stencil! 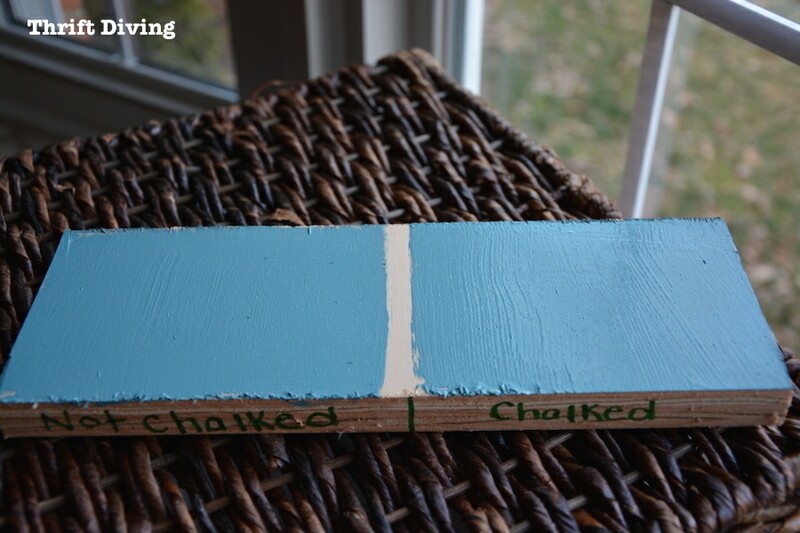 I’m wondering if this method of chalk paint would work with blending and layering. What do you think? Example: say with an ombre effect. 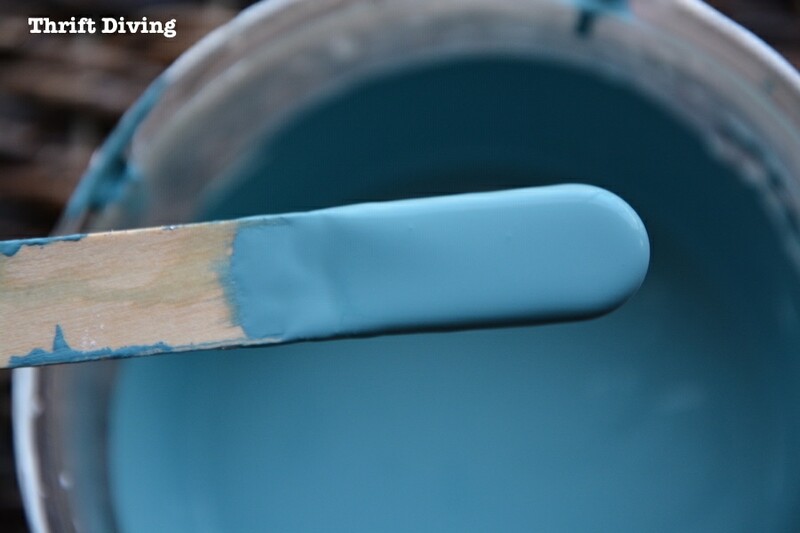 I know diy chalk and clay based paint will blend easily with some water. Thanks in advance. Okay, I am going to get a little bit snarky here… First of all, I’m not questioning the quality of BB Frosch powder, I’m sure it’s great, but I am questioning the whole attitude behind the email. How is it that BB Frosch chalk paint powder makes latex paint any more a chalk paint than calcium carbonate would? It’s still latex paint with an additive, which I have absolutely no problem with- I just find that to be a bit of a double standard on BB’s part. Also, if their wax almost gave you a headache-that doesn’t sound very environmentally friendly to me. I think they need to do a little self-observation. I make my own chalky paint with calcium carbonate and I use BEHR samples. I will be trying some Benjamin Moore because they have gorgeous colors as well. I actually like the finish of DIY chalk paint better than the two brands of chalk paint I worked with. To me, the bottom line is this: if the paint is good quality and the finished product is good quality… Who cares? I can’t afford to drop the kind of money that these boutique bands cost and I’m happy with the way my pieces turn out. I was in Ace Hardware the other day and they have a product called chalktique chalk paint powder and it’s very inexpensive, I think it was $4.99 for I think, 6-8 oz. I’m going to try it and maybe you can give it a try as well. Dover’s also has a reasonably priced chalk paint powder and it’s available on Amazon. Awesome! I want to try the calcium carbonate with the sample paints. Do you know if this method will blend well? I know the debi’s diy chalk and clay based paints blend great with water. I’m wanting to do an ombre effect on a furniture piece and really need for the colors to blend organically. I tried plaster of Paris with no luck. Any idea on how durable the finish of chalk paint is if you want to use painters tape and put stripes on furniture? Don’t want to do all that work and then pull the paint off with tape! 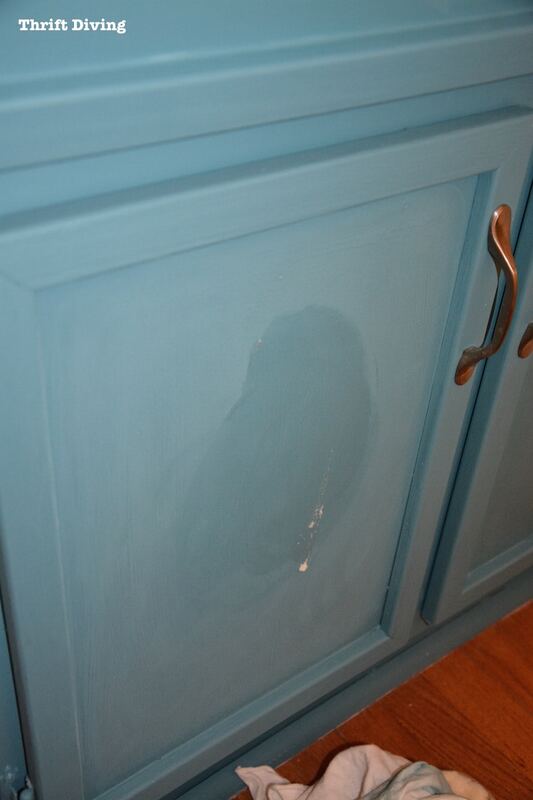 I used BB Frosch for my kitchen cabinets and was very pleased with the outcome but totally agree about the wax. I was using a white paint and I thought the wax yellowed the cabinets a bit. I used my leftover AS wax and was happy. I may try your Miss Mustardseed a try. Glad it wasn’t just me that found the smell overwhelming! I’ve actually started testing out using a topcoat from General Finishes that has worked really well! Hi! Sorry for my english, because I’m from Russia, where we don’t have chalk paints at all and need to purchase from Amazon (and it takes more money of couse) or “DIY” it. I just wanted to say that i’s really funny example about baking soda and baking powder, because the only difference is that in baking soda you don’t have an acidic ingredient and you need just add it, so wedding cake won’t be broken:) Also I didn’t understand what is wrong about gypsum (aka plaster of Paris)? Here, in wild Russia, we use it without any fear and I’ve never heard that it’s dengerous. Is it realy so? Anyway thank You, it was interesting and your bathroom is amazing! Thanks for the compliments on my bathroom!! It is only dangerous if you breath it in. The tiny particles can damage your lungs if exposed to it for a long time without protection. Just wear a dust mask and if you can work outside and you will be fine. I think I might try another alternative to see if it works just as well, Banana powder or other fine mineral based makeup product. chalk paint. Thank you in advance. Thanks Serena for your wonderful Blog! I learn a lot!! Unfortunately we don’t get this in South Africa, and the Annie Sloan products here are very expensive. But luckily a few local diy shops have created their own brands which is much more affordable. In case of emergency though, jip, I’ll still whip out the plaster of paris! You are all so lucky to live in a large country with a large population and can get this huge variety of products. I live in New Zealand, there are only 4 million of us!!! None of the large major paint retailers have heard of chalk paint, they directed me to the blackboard paint section! There are three outlets in Auckland (the largest city in the country with 1 million population) and they only stock Annie Sloan which at $60 per litre can I though expensive. Through research on the good old interweb! I found a woman in a suburb of Auckland who has her own chalk paint business from home, $40 per litre can. Needless to say I bought from her, loved my dressing table, bedside cabinet and jewellery chest (it is the size of a bedside cabinet). I didn’t like her liquid wax so just used good old bees wax from the local hardware store. But what a palaver to find the paint…..so ladies again I say YOU ARE SO LUCKY!!!!!! !